If you are considering getting your first road bike, ideally you would be able to spend a minimum of £400 – £500. This would be enough to get you a decent entry level bike and give you a few options. 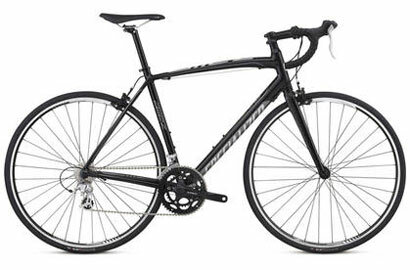 Many companies, start their ‘entry level’ road bike around this price of £500. For example, for around £400-£500 – you could buy a Specialized Allez C2, GT GTS2 bike, Boardman Sport and quite a few others. 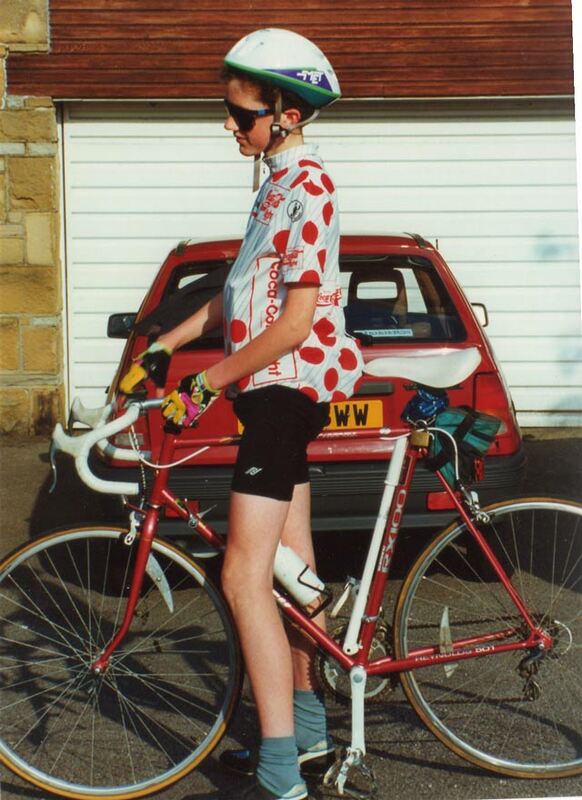 My first road bike from Ellis Briggs, Shipley. It cost £270 and was about three combined birthday / Christmas presents. It was a Raleigh 501 steel frame with now obsolete Shimano RX100. By the way, I wasn’t fat as a kid – I just shoved about 3 maps down my front and a jumper in the back. The king of the Mountains jersey was absolutely my favourite. If you can spend £1,000 then you can get quite a significant improvement on these £500 entry level bikes. The range £500-£1,000 is very competitive these days, and you can start to get carbon frames and good groupsets. 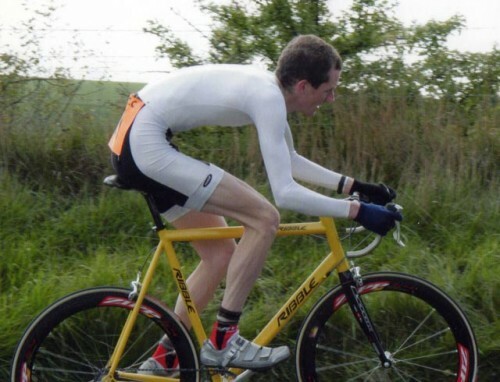 Although, you can spend several thousands of pounds on a road bike, the difference between a £1,000 bike and £4,000 bike is not that significant for an amateur who is just doing some general riding / sportives. If you are a newcomer to the sport of cycle races, your results will not be significantly better for spending an extra £4,000 – at least in the beginning. It is sound advice to buy the best frame you can. With a good frame, you can always upgrade components later. For example, a good value deal for your first road bike, would be to look at a Raleigh Revenio Carbon or Trek Madone 3.1 (£1,100) Both come with a good quality carbon fibre frame. It is the kind of frame you can build on and later get a top of the range bike. But, don’t feel a carbon fibre frame is essential. Aluminium frames can offer excellent value for money and can be as light as carbon fibre. Also, there is a big difference between different types of carbon fibre frames. Also, don’t discount other frame materials, such as steel / titanium. 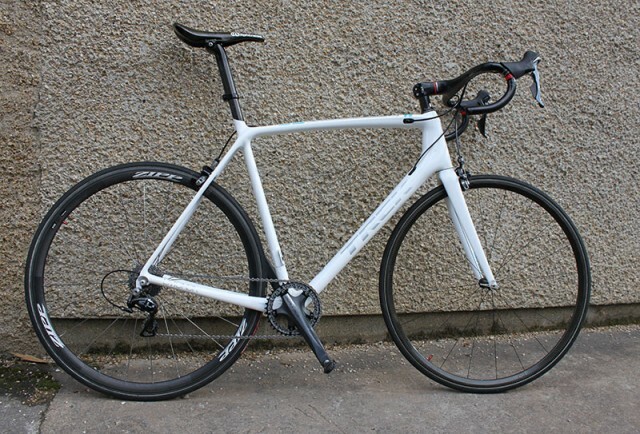 Third road bike – Ribble Scandium frame. Using it here in hill climbs. It’s now in the loft – stripped of parts as a backup winter training bike. In my case my first road bike cost about £700. It was from Ribble Bike builder, based on a Ribble Aluminium frame with Shimano 105 group set. It was excellent value. I really got into road cycling. After 5 years, when I got serious about cycling I spent £5,000 on a Trek Madone 6.9. I still use my Ribble as a winter training bike (after 15 years of ownership) so don’t worry about getting a £500 bike, it can easily become a winter training bike. When you have a top of the range bike, you don’t want to be taking it out on salty roads in the depth of winter. Buying Online or in a shop? Not all local bike shops are equal, try to find one with an interest in road bikes (rather than just hybrid / student bikes). For example, I wouldn’t bother with the Cycle King variety of cycle shops. 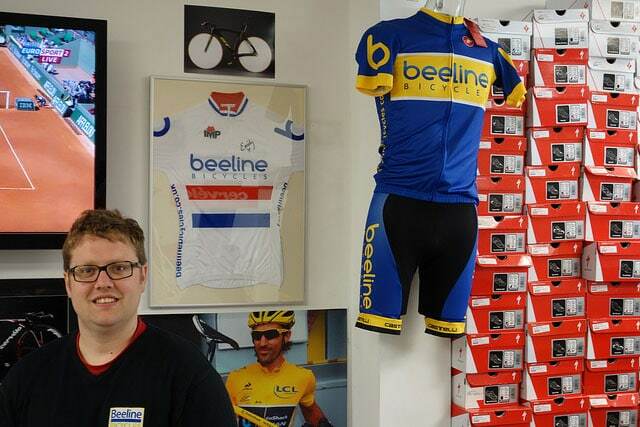 For example, in Oxford Beeline bicycles now has a specialist road bike section which is a good place to go. I’ve bought a couple of bikes there – often through the Trek Project One system. This is a good combination of online choice, and also using a local dealership. I also like Evans Cycles as you can combine local shop, with some of the benefits of online economies of scale. Buy in September when you can start to pick up last year’s models at a cheaper price. This is the easiest way to get a good discount. Last years models can be 10-30% cheaper, but there is only 1% difference in quality. I’m riding a winter training bike which is 15 seasons out of date. But, it does a good job. Extras. If you buy at a local bike shop, try asking for a few ‘free’ extras. e.g. ask for a tyre upgrade or some bottle cages e.t.c. Most bike shops will be willing to do this. I’ve never really got into buying bikes second hand, so I don’t have much advice here. You can save some money, but you need to know what you’re doing. I might be selling a Trek Madone (2nd hand) soon. What Do you Need From Your First Road Bike? Will I be using it for racing? Which material do I want? Carbon fibre frame and fork means you will need to pay over £1,000 but it gives a more comfortable ride. Aluminium tends to be cheaper, but don’t write off aluminium, it is still very lightweight and strong. Some brands are more expensive. If you want a premium Italian brand like Bianchi or Colnago, there tends to be some premium for the image associated with the bike. You might find better value with American bikes like Trek / Specialized. British Raleigh bikes have also made a strong comeback recently, and they have produced quite a few entry level road bikes. Best place to buy? Would you need help setting up / bike fit? Aero or lightweight. Some road bikes are becoming increasingly specialized e.g. bikes based on weight (Emonda) vs Aerodynamic bikes. For most people buying first road bike, I wouldn’t worry about this distinction. Tubeless ready? More bikes are coming ready with tubeless ready technology – if you set it up right, you can really limit the amount of punctures you get. Do I need electronic shifting? Shimano Dura Ace / Ultegra Di2 is a great product. I gave an enthusiastic review here. But, I should really have added, it’s not necessary. Mechanical shifting is still very good. Only if you are looking for very tiny marginal gains in hilly time trials does Di2 really come into it’s own. At the end of the day, electronic shifting is a lot of money for not particularly a lot. The market for road bikes seems to be continuously expanding. You are faced with a huge range of different companies, models and combinations. It’s impossible to do a review of whole market – it would take forever. In reality, there is not a huge difference between different bikes – often they have similar components, and similar frames. Often friends ask me to recommend a bike for between £500 – £1,000 and I find it a difficult question to answer. The truth is there are many good bikes at this price range. I don’t think there’s anything that really stands out. These are three bikes, I know a little about, but I could easily have chosen many others. The Trek 1.1 is based on Trek’s starting Aluminium 100 series tubing. It comes with Shimano Claris 16 speed. Compact gearing 50/34. 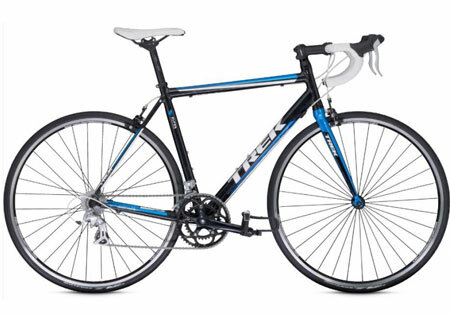 This Trek 1.1 is around £575 and makes an excellent starting bike. I use an older series similar spec Trek for my commuting bike. 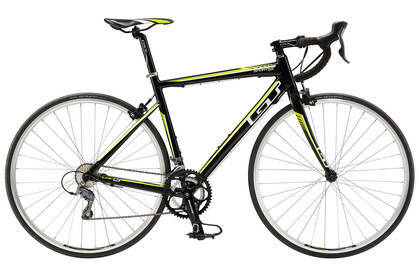 It is not flash, but an excellent way of getting a decent road bike for around £500. As you would expect at this price, there is no carbon fibre in fork or on stem / handlebars. But, the aluminium is sufficiently comfortable in the ride. Trek 1.5 with carbon fork and Tiagra gearing. Trek 1.7 Aluminium Frame, Carbon Fork. Shimano 105 groupset and Bontrager components. Ellis Briggs, a proper bike shop along with Pennine, Lambert’s and Rayner’s in Idle.